The first batch of ProChoices therapists. ProChoices is a by-donation Narrative Therapy clinic that runs on a feminist, social-profit model, located in unceded xʷməθkʷəy̓əm, Tsleil-Waututh, and Skwxwú7mesh Territory, Vancouver B.C. It is made up of a team of local and international therapists from diverse backgrounds and therapeutic schools/approaches. We come with different political commitments, yet we are united in our efforts for positive change in our communities and in our desires for rigorous peer-to-peer learning. ProChoices Community Therapy Clinic was founded in 2015, in response to therapists’ requests for practice and supervision opportunities in Feminist Narrative Therapy; and the lack of quality, affordable and accessible therapy for those without the financial means in the community. As an alternative to investing in a capitalist model for personal profit, Hilda Nanning founded a community clinic and provided the required financial funding for the first two years of its operation. Today, with the ongoing support of client donations, immersion program revenue, continued sponsorship from Hilda Nanning Counselling, and the passionate work of our team of therapist, ProChoices continues to expand its client wait list and therapist placement at a rapid rate to meet the growing demand from the community. Fueled by the core principles of Feminist Narrative theory, anti-oppressive practice and ethical integrity, ProChoices is committed to offering accessible, quality therapy to individuals and communities of diverse genders, sexual orientations, socioeconomic and cultural backgrounds, and life experiences. We understand affordable therapy to be social justice activism as well as a response to the individualist, euro-centric/hegemonic, capitalist patriarchy we live in. ProChoices credits clients as the experts within their own experiences and as the authority on what constitutes meaningful change in their lives. We do not prescribe or pathologize, but instead invite a co-research experience for our clients. This co-research process opens up alternative ways of experiencing, responding, and resolving the challenges and problems that might stand in the way of our clients’ wellbeing. Since 2015, ProChoices has grown from just an idea to a thriving learning community running at full capacity. To date, Learning Therapists at ProChoices have provided over 4300 hours of therapy to the community. 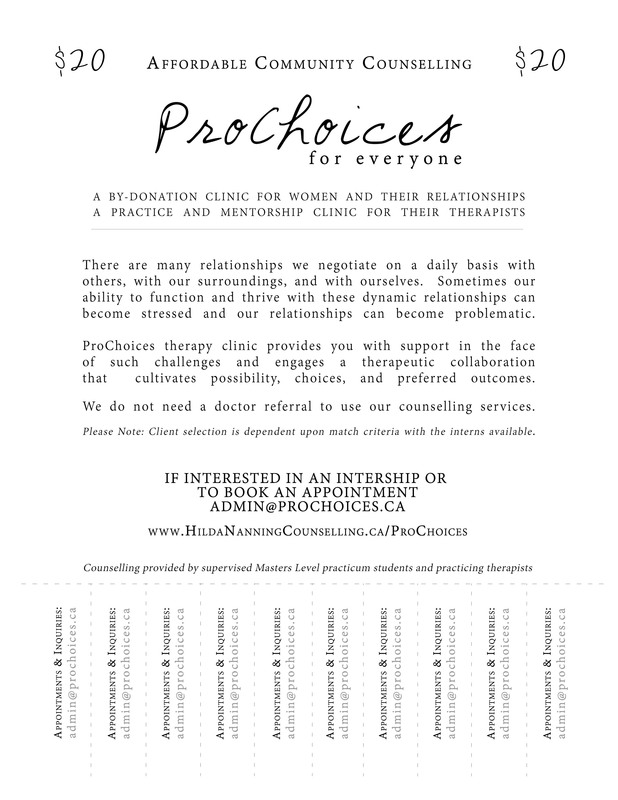 The name ProChoices emerged out of a dialogue between Anna Williams – a graduate of our first learning cohort and co-founder of the clinic – and our clinic director and supervisor, Hilda Nanning. For Nanning, it is about engaging a critical perspective and movement towards prefered ways of being. “For feminists ‘choice’ is about more than whether to end or continue a pregnancy,” she says. Nanning and the therapist clinic team remain interested in the public discussion that the term ‘ProChoices’ stimulates. ProChoices is made up of a team of local and international therapists from diverse backgrounds and therapeutic schools/approaches. We come with different political commitments, yet we are united in our efforts for positive change in our communities and in our desires for rigorous peer to peer learning. To provide quality low-barrier counselling while cultivating a community for learning Feminist Narrative therapy. Our Code of Values guides and fuels us in all we do. Folks trust the advice of their friends, family and peers, and here is where you come in and help us make a difference! ProChoices aims to reach out to therapists who wish to enhance their practice skills, community members to wish to get involved, and to clients who, otherwise, might not have opportunities to see a counsellor. 1. Tell your friends, family, neighbours, and professional networks about our services. 2. Follow us on social media, share and repost our posts! We have a clinic Facebook & Twitter page. 3. Post using #LittleClinicThatCan to let us know what you think about our services and share your story with others. 4. Our poster is available for download here. Post it on your personal blogs or website or public bulletin boards; hand it out to interested folks, or to pass it on electronically to your community/networks! You can also pick up hard copies of our business cards, upon request. 5. We are always looking for likeminded folks to join our team, so check out our job openings here.